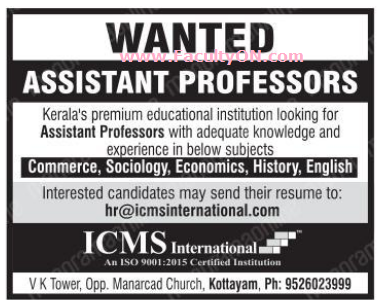 ICMS International, Kottayam has advertised in MALAYALA MANORAMA newspaper for the recruitment of Teaching Faculty- Assistant Professor jobs vacancies. Interested and eligible job aspirants are requested to apply as soon as possible from 20th June 2018. Check out further more details below. About College: We are an institute offering career-oriented UG courses, integrated with life-skills trainings with active presence in three prominent districts across the state of Kerala viz Cochin,Kottayam and Trivandrum. At ICMS we strive to tap into the hidden meta mind of students thereby finding the trajectory between their academic and social life. This process has helped us to penetrate into their talents and direct their efforts to a clear focussed career path with tons of opportunities to grow and prosper. Reference: Advertisement from ICMS International, Kottayam on MALAYALA MANORAMA newspaper dated 20th June 2018 for the recruitment of vacancy position such as Assistant Professor jobs. See the copy of advt below.